Of all the [tag]basketball shooting drills[/tag] I use, this one is one of the best for your youth teams. It is a [tag]basketball drill[/tag] we do as a game and it helps the kids get the proper form for shooting and finishing. They are 10 -12 ft from the basket (depending on age) and they have to shoot one handed. When they release the [tag]basketball[/tag] they have to form a “goose with their hand and arm, with wrist bent to simulate a “goose”. They get 5 shots around the perimeter and each one they make, they get a letter: 1st shot made=G, 2nd shot made=O, and so on. They do get 3 chances but only 3. This basketball drill will make them concentrate on taking the time to do it correctly. Winner does not have to run a set of suicides when it’s time to do running at the end of practice. 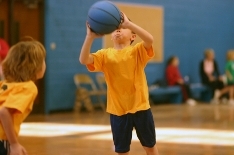 Kids love to compete and this teaches them proper form for shooting the basketball.